As I've mentioned, Q is quite adept at climbing stairs...and quick! My peace-of-mind can't handle constantly corralling him or carting him around with me....so the kids have been on a quest to build a structure impervious to Q's conquering skills. We don't have a baby gate anymore, so we've taken it on as a challenge. First, we laid a kitchen chair on its side at the bottom of the stairs. He used the chair's spindles as ladder rungs and climbed right over. Next, we laid two chairs head to foot to make the fortress wider. He climbed under and through the feet. Then we stuffed pillows in the spaces so he couldn't squeeze his little Houdini-self through. He managed to do it anyway through an extra space on the side. Finally we pulled over my favorite red chair to fill the gap. 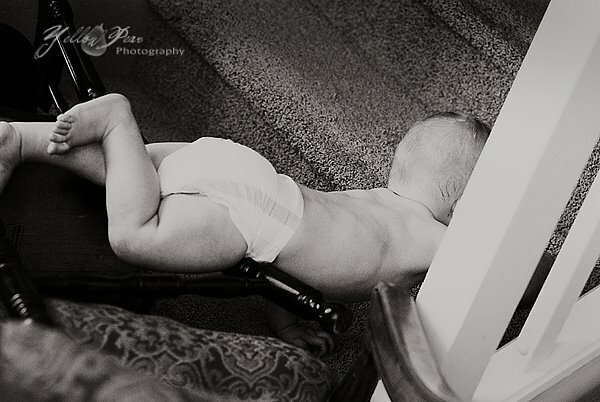 He simply grabbed onto the chair sides and hefted his body up and over the sideways chairs...pulling, pushing, wiggling and maneuvering until he made it to the stairs. Actually I'm not really sure how he did it, but there he was on the other side. He is determined. But so am I. I pulled over the coffee table, turned it on its side and it fits perfectly and he cannot climb over it....yet! It's a bit cumbersome for us though too...I guess I may have to break down and buy a gate. Gosh if anyone is coming to visit you soon, I could send one to you. I have two up in my attic and we dont have stairs inour house so I am afraid they'll never get used. One is a really cool wooden one. Let me know k, I'm serious..You can totally have it. We put up a gate this weekend. But only at the top. I want to be able to let her play upstairs with the kids without worrying. Now I have to open it for Liam 10x a day. She hasn't discovered them at the bottom yet...i'm sure it won't be long! She's pretty sneaky too. 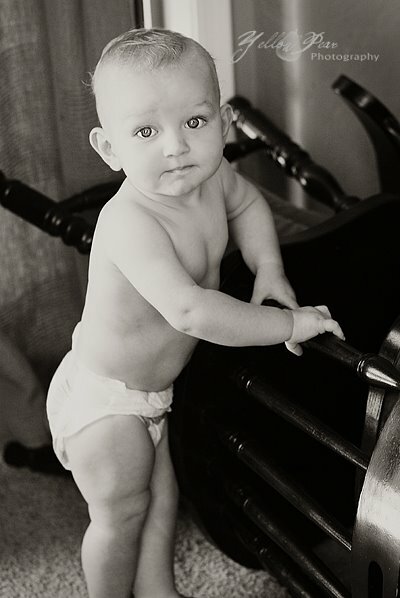 Man he is such a studly little baby...can babies be studly? I think they can, so it is done. He's going to be some kind of amazing athlete I believe. I love the ambition :) I agree, he looks very handsome in a diaper! Why are stairs and garbage cans so fascinating to babies?